Because of the large volume of pictures from start to finish (it took me days to organize and edit the MONTHS worth of photos), I put together a slide show of the progress from uncovering the brick on our property to putting it to good use by creating a walkway and patio under our grape arbor and gazebo. Now not only can we enjoy our backyard patio for dining al fresco, the covered barn patio for entertaining, we now this quiet beautiful private little space too. That’s where you’ll find me on pretty days. Just wait until next year when I can add some fun DIY decorative accents! I love the herringbone pattern and that we were able to use bricks we already had on hand. It’s such a good feeling and the fact that it’s old and not new? Loooove that the most! It looks as if it’s been here at least half a century and fits with the age of our old home. See the entire grape arbor gazebo before and after reveal here! 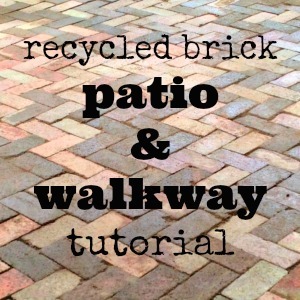 It may have taken all summer but Mr. DIY did an awesome job at repurposing all of that brick to create a gorgeous recycled brick patio and walkway, didn’t he? What do you think? Love it? Not your style? We’d love to know your thoughts. This entry was posted in Exterior, grape arbor, Misc., Outdoor Areas, Roeshel's Projects, Thrifty Treasures and tagged brick, DIY, landscaping, Outdoor Areas, patio, recycling, repurpose by Roeshel. Bookmark the permalink. 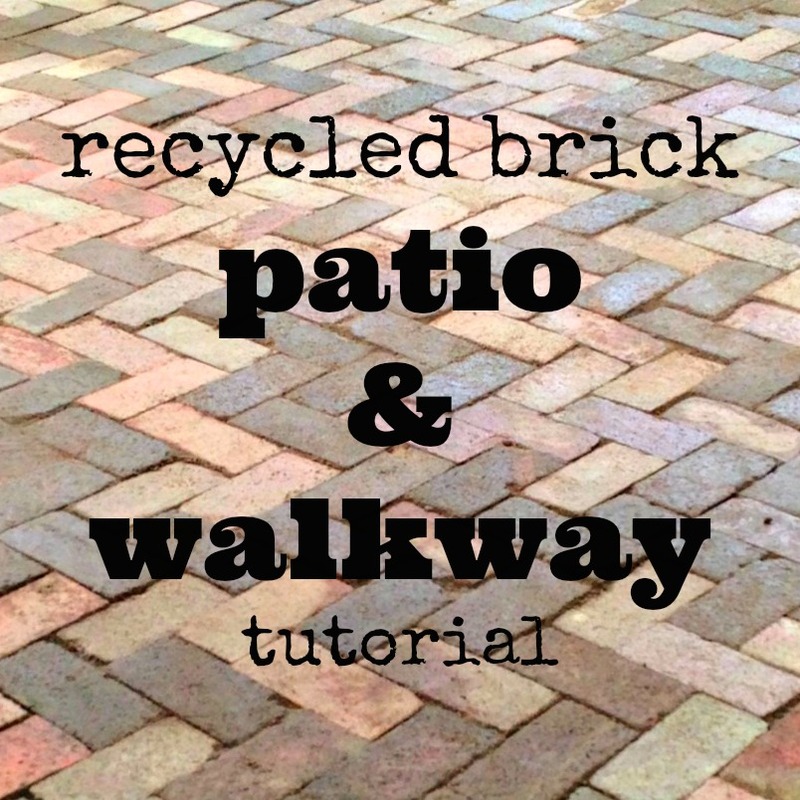 I love brick patios and I can’t wait to see the entire before and after reveal. Love it! I have seen so many great patio projects lately and yes maybe because I am just sensitive right now. We are doing our own patio (which we did hire out). While I would have loved to have used brick there, it seemed to be something anti-climactic about pulling thousands of brick out a patio, just to put them back. and yes you should see the multiple stacks – the hope is to use some to line the sidewalk at the front of the house and to create some sort of basket weave type stepping stone in another area in need of hardscaping. maybe one day I create a pad between my two sheds … ha! do dream. Great project. thanks for sharing. What a wonderful transformation – you have given me some ideas! Stunning and just my style! Beautiful job! Totally my style! I like the staggered bricks look too, I’m sure your patio is going to look great! Absolutely beautiful brick patio. I LOVE it. Well worth the work. Seriously a show stopper. That is such an amazing addition to your property. You’ll need to rent that beauty out for a wedding now. Great job RUSS 🙂 I know our guys are behind so much that we do. It’s a stunner!! It looks amazing. To me a brick patio and walkway says “old England”. It’s charming and is a way to combine the modern way of life of living outside a lot and the old look of worn walkways! It’s my dream to have a brick walkway later! I’ll be back to check the full reveal! This is absolutely beautiful. A dream for me. Congratulations for all the hard work and beautiful design! What a beautiful feature to have in your back yard. It’s really great. A lot of back breaking work but worth it, don’t you think? I love what y’all did!!! It’s beautiful! I am inspired as I have a pile of pavers in my backyard that I’ve been thinking about repurposing myself. AND I’ve wanted to plant some grapes forever. Thanks for posting your labor of love. It gave me ideas. I only have one question… do you lease out your husband? Love the brick walkway! You have just inspired me to create a walkway from my garage to my side entry door. Thanks for the great post! I discovered some landscaping rock at our last house…it was like hitting the gold mine! I reused it in my yard and even gave my parents some. I love that you got to create a new outdoor area to enjoy with found brick. Herringbone is such a classic pattern…just my style. Oh my gosh. Roeshel, it is gorgeous. I am going to grab a good book and a bottle of wine and I will be right over. 😉 What a wonderful spot to relax – I love it. Pinning, of course! It’s neat to see this DIY project from beginning to end, and the whole photo documented journey. You did a wonderful job. As an exterior remodeling company, we get involved with some extra DIY projects, and they’re really fun to show off. Our crew just custom-built a Pergola, and it was very exciting. Great job on your DIY projects!